live animals have become a rarity, and android versions have taken their place. Now, due to this unsavory condition the Tyrell Corporation developed androids, notably the Nexus 6 to help the human race in their time of need. Unfortunately the Nexus 6 aka replicants began to develop their own sets of thoughts and processes that they began to rebel against the humans. Tyrell Corporation put in a failsafe in the replicants to prevent such a process from happening, the failsafe was that the replicants will have a lifespan of only four years, but even with the failsafe the replicants became too big a threat. To destroy aka “retire” the replicants, the Blade Runners were put together. And that’s what you need to know :D now, our story begins years later, almost all of the replicants are destroyed and the Blade Runners themselves are retired :D when all seem to go as planned, four replicants reappear on Earth. 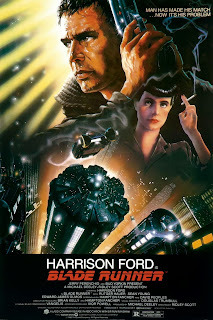 Now, it’s time for Rick Deckard (Harrison Ford) to come out of retirement and take care of the replicants. That’s the basic story, throughout the movie Deckard will be in the hunt for the replicants. The visuals are amazing, for a movie made in the early 80s. Ridley Scott is a genius in that way, he makes the most out of what he has, and this movie is just perfect. I mean if you compare Avatar and Blade Runner with visual effects, Blade Runner will easily take the cake keeping in mind the technology available at that time. Now, it’s time to judge, the movie is actually pretty boring for a while, I mean it’s just search and destroy and it gets on your nerve, not that the visuals are less appealing or the action sequence aren’t great, it’s just that it’s not exceptional either . Yes, there’s a “but”, but, the ending is brilliant, I mean, really brilliant. The message that the movie leaves behind, leaves an everlasting impression. I guess, when you watch the movie from a human perspective, you will think “what the f**k do these androids want?”, but as the movie progresses and you see the androids perspective, it’s downright beautiful .So watch this movie with an open mind and take to heart the message it leaves behind. For a man with all the time in the world, beauty eludes him, whilst a man with little time to spare, all that he sees is beauty.